Digitally matched & tested valves – Large range of amplifier re-valve kits – Next day delivery – Best prices! Welcome to Guitarlodge, the guitar & amplifier repair specialists based in the county of Suffolk, South East England UK. Established in 2008 we offer the complete guitarist repair service & continue to serve musicians all over the country from our professional repair centres. With a large customer base, over 25 years experience in guitar & amplifier repair & a reputation for high quality workmanship; Guitarlodge is the place to go for guitar & amplifier repairs in the UK! Our repair centres are based in Ipswich & Felixstowe (Suffolk) UK. Both have easy access from the A14 & free parking. If you prefer, we can offer collection & delivery of your instrument via our courier service from a location of your choice. Carriage can be arranged via the enquiry form on our contact page. Trust Guitarlodge for guitar & bass re-frets, restoration & modifications, tremolo & bridge installations, custom-wiring mods, inlay & finish customisation. 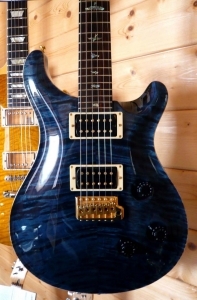 Why not try one of our professional set-ups, or talk to us if you’re thinking of upgrading your pickups or hardware? We carry out all kinds of repairs & modifications to all brands including PRS, Gibson, Fender, Martin, Ibanez, Rickenbacker & many more. 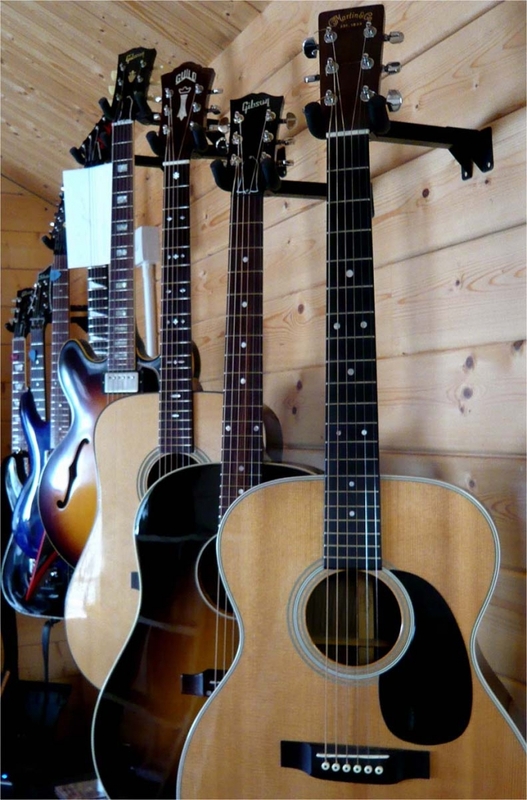 Our guitar repair service covers a wide spectrum; from broken headstocks, guitar finishing, electrical faults & broken truss rods, to acoustic repairs including lifting bridges, loose braces, neck resets & major structural damage. We offer a guitar building service, whether you require a project of your own completing, or a guitar built from custom parts! cannot find the particular repair or service you require on this site please contact us as chances are we can still help. Please take a few moments to look at our Facebook & Twitter pages for an insight into what we do or maybe post an enquiry. The content is regularly updated & includes photos & articles on many instruments we have worked on. You might also want to browse our galleries where you’ll find guitar & amplifier pictures, case studies & repair method details. We realise that a reputation for good quality & service takes time & has to be earned! From the moment you hand over your cherished instrument to us, you can be rest assured it will be worked on with great care & returned to you in pristine condition. 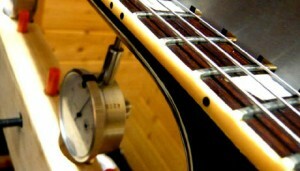 All instruments are insured whilst on our premises & all work is guaranteed. Any parts used on our guitar repairs & installations are of the highest quality, from fret wires & paints to potentiometers & switches. Our valves are supplied brand new, boxed & tested direct from the manufacturer. We then re-check the valves performance data at our repair centre using calibrated test equipment & closely match the power valves using an accurate digital machine. See valve testing & matching. Valves can either be purchased from our on-line shop, or we’ll install them for you at our repair centre. We can advise on valves if you are thinking about upgrading or even just replacing stock valves. Check out our large selection of valve amp kits if your tube amp is sounding a little tired out! The valves we stock are installed as standard (usually re-branded) in Marshall, Orange, Vox & Fender amplifiers amongst others, their tone & reliability has been favoured by some of the biggest amplifier manufacturers in the business! We offer some of the best online prices on Shuguang & JJ Electronic (Tesla) valves in the UK. Valves have a limited lifespan, so if you’ve been gigging your treasured Mesa Boogie rig for a while & wonder why the sound is muddy, or just doesn’t sound like it did when you first got it, then chances are you need new tubes or a service, in our experience both. We can help with all aspects of valve & Transistor amp servicing & maintenance including, valve & filter cap testing/replacement, electrical safety testing, valve biasing & general component cleaning/replacement. (Detailed service reports are included). Let us take care of your amplification repair & maintenance requirements. The Guitarlodge repair department has vast experience in all makes & models old & new, from vintage & boutique amps, to rack-mounted power amplifiers (valve or transistor). Our services are not limited to guitar & bass amplification, we repair PA system power amplifiers, stage monitoring, recording studio power amplifiers, keyboard amplifiers, valve HIFI amplifiers. 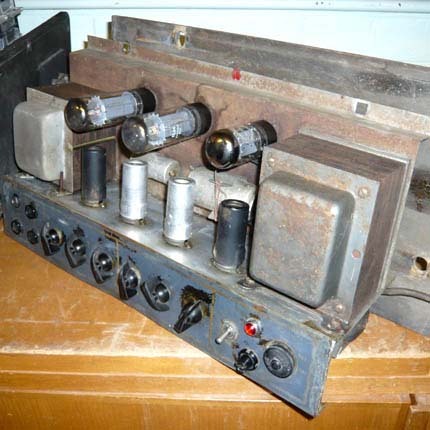 At Guitarlodge we have vast experience in vintage amplification & can offer a complete restoration service on valve & transistor amplifiers. 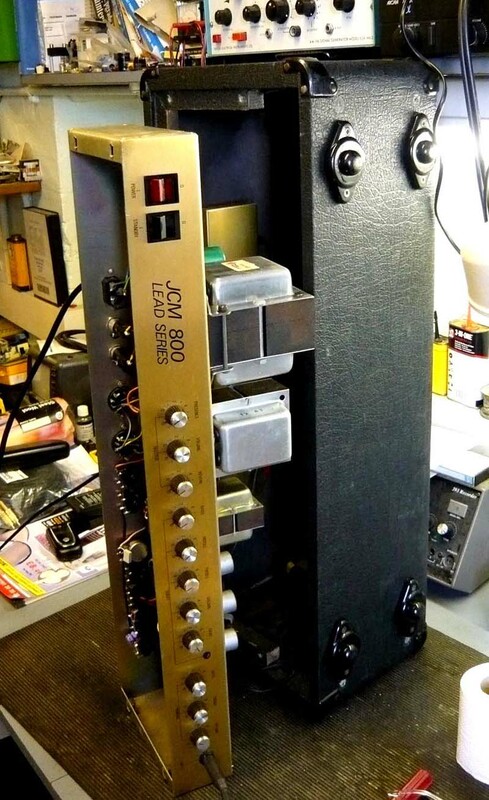 It is a fact that modern amplifiers are seldom built to the same standards as their vintage predecessors, & we regularly rebuild/restore vintage valve-equipped instrument amplification for players who have a certain criteria when it comes to their tone. Safety is an aspect we take very seriously & older vintage amplification can be dangerous if not maintained correctly. All our rebuilds & restorations are subject to stringent safety checks & include full detailed work reports as standard. “I tweaked the action up to my usual 2 mm, lubricated the nut with some Wilson’s Ultimalube gun oil I bought home from Texas, a bit of Finger Ease, and it now plays perfectly. Sustain is improved in the top three strings as hoped for and the jumbos feel just right. Great work! Custom guitar re-fret for Les Barton, Ipswich.